A healthy, well-rounded company culture features a variety of people and a range of employee work styles. 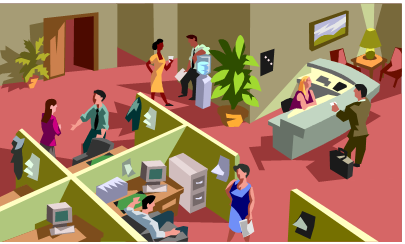 Row after row of identical cubicles may fail to meet the needs of everyone in an office. It’s no surprise that businesses are beginning to create more flexible and varied work landscapes to accommodate a diverse workforce and help everyone be more productive. Here are a number of ways you can use space design and office furniture selection to give everyone what they need. These workers prefer to be in earshot of interesting conversations so they can feel connected to office life. They thrive in an environment that is full of energy. These employees like to “talk things out” and rely heavily on input from others to do their best at work. A desking or benching system with low dividers can be an advantageous setup since it ensures close proximity to coworkers. In offices that primarily feature cubicles, extroverts may enjoy having the freedom to work in a lounge area using mobile technology. Being untethered from a desk and able to go “where the action is” may be seen as a significant benefit. If these workers do have permanently assigned workspace, they may like to change aspects of their workstation frequently to keep from feeling bored or trapped. These employees are likely to be most comfortable in low-traffic areas and with workstations that feature high panels to provide a sense of privacy. In an open office environment that doesn’t feature cubicles, providing enclosed spaces where employees can retreat occasionally for greater concentration is important. They may feel protective of their workstation and have a desire to customize it to precisely match the way they work. Introverted workers may also benefit from breakout areas for small team or one-on-one collaboration. It’s not that they want to be alone all the time, they simply need to have a choice about their level of social interaction on a daily basis. Offering greater flexibility makes these workers feel more empowered. How do you satisfy everyone in the office? You don’t have to hand over a catalogue and let every employee make their own selections. Next week, we’ll look at ways you can create a workspace that gives everyone what they need—and most of what they want. In July, we looked at a lot of up-and-coming office design trends from NeoCon contestants. That’s the perspective from the designers and manufacturers. Now, let’s take a peek at what office furniture and space planning experts think is on trend for this year. This company sees an uptick in the use of touchdown and breakout areas to provide what open office layouts lack. When individuals need privacy for concentration or small groups want a more intimate atmosphere for collaboration, they don’t have to reserve a conference room days in advance. Instead, the modern workspace features small nooks away from high traffic areas so employees can get more done. Contributor Meredith Lepore notes that mobility is the watchword of 2014. And we’re not talking about tablets and smart phones. Office furniture is the focus. Chairs have long been mobile, but now tables and pedestal files are too. Besides being rollable for fast reconfiguration of the office layout, tables also go up and down. The sit-to-stand trend is going strong and showing no signs of backing down. The Institute notes that space design itself is changing with the times. Business facilities are being re-planned based on the activities workers are expected to perform. Figuring out when workers spend time at their desks and when they are on-the-go or in meetings permits the implementation of more flexible arrangements. For some organizations, that might look like desk-sharing coupled with the installation of a resource center or even a coffee bar. Above and beyond the activity-based planning trend is the idea of creating a workplace that’s designed like a city. StrongProject points to this option as the way to strike a balance between a completely open office layout and a cube farm. Using a centralized hallway helps organize different types of work areas and directs traffic organically through the office for ease of navigation. Bob Brooke notes that 2014 is bringing people even closer together in the office—through continued consolidation. Rental space is down and ownership is up. Corporate headquarters wants everyone on the same page and in the same building. At the same time, there’s a high value on virtualization. Companies are spending more on high-tech videoconference rooms to cut travel costs and keep dispersed teams connected. The roundup wouldn’t be complete without a juicy article from Nikil Saval at n +1 magazine. It’s a satirical sendup of some of the most popular office furniture and design trends of the last few years. Nikil pulls no punches in sending up the sit-to-stand desk, the open office, and more. Who says office design planning has to be a serious business? Last week, we featured an overview of coworking trends and what a typical space might look like. This week, here are a couple of examples of specific coworking spaces at home and abroad. The Creative Class Group shares an exciting vision of the “New Work City”, a Fourth Place custom-built at The Squaire (near the Frankfurt International Airport in Germany). This location takes advantage of the fact that we live in a globalized age of commerce. The facility is designed to offer the atmosphere and amenities that promote social interaction and the wireless access, meeting rooms, audio/visual capabilities, and other technological perks that support modern business professionals. The goal of this New Work City is create an office hub that appeals to business travelers and local professionals alike. It’s billed as, “a central, easily accessible place where business people can network in a leisurely but intensively productive manner.” The Squaire itself is a mini-city under a single roof, and even has its own postal code. Here, busy professionals can access everything from daycare to dry cleaning as they give up on balancing work and life and finally blend both together. The European trend is matched by a growing taste for highly flexible, affordable incidental workspaces in the U.S. David Port writes extensively about the American coworking phenomenon in an article for Entrepreneur.com. He showcases various coworking sites across the country. Most feature the basic furnishings and equipment needed to get work done in the digital age. Some offer additional amenities such as a sense of community or on-site childcare. Manhattan has its own New Work City under the leadership of Tony Bacigalupo, the co-founder and “mayor”. Unlike business centers such as Regus, this is a fully hot-desked environment. There are no dedicated workspaces, and conference rooms aren’t rented out. It’s all first-come, first served. Bacigalupo points to one unifying thread that seems to make the coworking concept really work. People who choose these work environments tend to be sociable by nature—and they only come into the office when they want to. What ideas can you glean from coworking spaces around the globe—both massive and modest? Giving employees more control over where they work can help them be more productive. For those working from home or on the go, offering a monthly stipend they could spend on a coworking space might be a great perk. In the office, not all workers are married to their personal workspace. Some would feel more free to get things done if they could choose a workstation that suits them based on their mood or assigned tasks from day to day. Touchdown spots, work lounges, and “Quiet Spaces” could add more choices to the work environment. For more customized advice, contact The Office Planning Group for a one-on-one space planning consultation. With mobile technology freeing office drones from their desks and 24/7 connectivity erasing the boundaries of a 9-5 job, bringing work out of the office and into the world is now a common occurrence. However, the limitations of the local Starbucks as an alternative workspace are also becoming evident. While workers might once have chosen their home or a café over the corporate office, the distractions and lack of appropriate infrastructure pose a real problem. The ‘fourth place’ is a term coined by author Richard Florida to describe an entirely new set of spaces where people now engage in work. In this series, we’ll explore a few ways this trend is gaining traction at home and abroad. Having an office away from the office isn’t just for ‘creatives’ and people traveling to handle international business deals. Many small, local businesses and independent professionals also get serious business done in these ad hoc working environments. Coworking spaces are no longer restricted to trendy locales like Silicon Valley and New York or Boston. They are becoming part of a much larger industry as a feature in business centers. Kimberly notes that the Arlington, TX location serves a demographic that is heavily sales oriented. 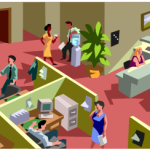 The coworking spaces provide desks, storage, broadband internet connectivity, and printers or fax machines to support daily work. Other sections of the business center include a staffed reception area, a lounge, break room, and meeting rooms to support the full range of business needs. According to Lilley, “The design team tries to keep the theme and furnishings fairly consistent from one site to the next. We have people come here who’ve been to some of our other locations and immediately say, ‘Oh, you’re a Regus!’ It’s very recognizable.” That’s a tip that any business with satellite offices can use. It’s not just the color scheme that conveys your brand. It’s the quality of the office furnishings, layout, infrastructure and more.